The International Olympic Committee shocked many today by announcing that it is dropping wrestling as an Olympic sport for the 2020 Games. Instead, they will add golf. That’s right, they are dropping one of the original Olympic sports that go back to the inaugural modern Olympics in Athens in 1896 and one of the few sports traced back to ancient Greece. However, we will keep synchronized swimming and Rhythmic Gymnastic routines with ribbons and hoops. The IOC is known to most people for its long history of corruption and excess. However, it will occasionally take a break from self-dealing to undermine its institution. The sport of wrestling featured 344 athletes competing in 11 medal events in freestyle and seven in Greco-Roman at last year’s London Olympics. It also was one of the unbroken links to the origins of the Olympics and one of the most impressive physically demanding sports. It will now be replaced by golf? The decision seems overly cynical and opportunistic. There is more money in golf and viewers around the world. Yet, wrestling is a sport that is part of school programs around the world — programs which will be adversely affected by this decision. The selection of golf shows the continuing control of money over the IOC members. Golf is supported by major companies willing to spend a lot in wooing IOC members. Notably, the IOC looks at television ratings and ticket sales to make its decision as well as global participation. However, this is not just another sport but one of the classic competition of the Olympics. Tradition should mean something to the IOC. It is bad enough that dance routines on the gymnastic floor and synchronized swimming is making the Olympic look increasingly like a Vegas act. Why not cut dubious competitions like shooting which require a fraction of the physical ability of wrestling? I am not a wrestling fan, but I do love history and believe that some traditions lend authenticity of an event like the Olympics. The IOC has demonstrated with this decision that it is continuing to shed its sports orientation in favor of a business model. If the rating and sponsors were good enough, the IOC would make a chorus line an Olympic sport (which is already close to reality with Rhythmic Gymnastics). I have long been a critic of the IOC which seems to fulfill and surpass the worst expectations of many of us each and every year. However, this decision has set a new low for the IOC. “I’m not against some of the other sports that the IOC decided to keep, but I want to ensure that no one tries to squeeze middle-class kids out of a chance to compete on the international stage—especially in a sport that was part of the original Olympics and is the third-most successful sport for the U.S. in the Summer Games. That’s why I recently introduced a Senate Resolution opposing the elimination of wrestling from the Olympics. My former colleague, and Wrestling Hall of Fame Member, Jim Jordan (R-OH) has introduced a similar resolution in the House. On behalf of thousands of high school students and two 2012 Olympians with Ohio connections, we are asking the IOC to reconsider eradicating one of the original Olympic sports. Wow, that’s what I was seeking for, what a stuff! existing here at this web site, thanks admin of this web page. BUT,the ribbons are sooo pretty!! I find it interesting that they used ticket sales as guideline. Because of the assinine ticket contracts with various vendors in each country, you could be a US citizen like me, in London during the Olympics, but could not purcashe a ticket. Memo to the International Olympic Committee on the heels of a preliminary vote to drop wrestling at the 2020 Olympics: You’ve got a fight on your hands. Dan Gable, arguably the most iconic American name in the sport, vowed to work at changing the decision before a final vote in September. The IOC entered a vote to trim one sport from the current list of 26. Wrestling was voted out from a final group that also included modern pentathlon, taekwondo and field hockey, officials familiar with the vote told The Associated Press. They spoke on condition of anonymity because the voting details were not made public. The final vote will occur at the IOC’s general assembly in September in Buenos Aires, Argentina. Mark Adams, IOC spokesperson said “today’s decision is not final” — though reversing course so soon would be considered an upset by many who know the organization. Gable, a national champion at Iowa State and record-setting coach at Iowa, recorded one of the most dominant Olympic performances in history — regardless of sport — when he won a freestyle wrestling gold medal in 1972, without surrendering a single point. 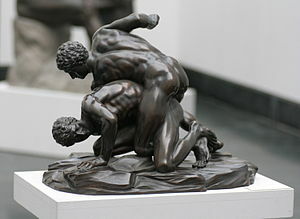 Wrestling is among the oldest sports offered at the Olympics. It was part of the ancient games, and was contested at the first modern Olympics in 1896 in Athens, Greece. “It’s not like you have a sport like baseball, that has a pro baseball league that’s outstanding — so kids can dream of going places beyond the educational system,” Gable said. “So that kind of eliminates the high end for us. You continue to have world championships, but it’s tainted big-time if you don’t have the Olympics behind your sport. “According to former Olympic champion and current Iowa coach Tom Brands, the international wrestling community needs to band together and fight for the sport’s Olympic future. The decision by the IOC to phase out wrestling will leave the U.S. without one of its most successful Olympic sports. The only sports in which the Americans have won more medals than wrestling is swimming and track and field — and those two have far more medal opportunities. Americans have won a record 113 freestyle Olympic medals, by far the most of any nation. Though the U.S. had slipped in recent Olympic cycles, it bounced back with a pair of London Games gold medalists in Jordan Burroughs — possibly the best wrestler in the world — and Jake Varner. Wrestling is also one of the most popular youth sports in the U.S. The National Federation of State High School Associations reports that the sport was sixth among prep boys with nearly 275,000 competing in 2010-11. Reaction to the move was swift on social media. A Facebook page titled ‘Keep Wrestling in the Olympics” was started Tuesday morning and had nearly 34,000 likes by the end of the day. A number of fellow Olympians also displayed their displeasure over the decision on Twitter by using the hashtag (hash)SaveOlympicWrestling. And you’d be wrong, Mark. I’ve been to more than one collegiate (and high school) wrestling in the last decade. But don’t get me started on WWE “professional” wrestling. It’s just wrong on many levels. Those guys are athletes, I’ll give them that, but they aren’t wrestlers. They are stunt men. If you really did some of the things they pretend to do, you’d have a massive and very real body count for that faux-sport. I am willing to bet everyone here complaining that wrestling is being pulled by the IOC hasn’t paid to see one collegiate wrestling match in a decade. That’s about the only place you can find it. Most people think wrestling is the WWE variety. It says something about a sport when its most popular version is a parody of itself. you miss the point. I personally hate this kind of wrestling and that hatred began in High School, where for a month each year that’s all we did in gym class. My gym teacher, who hated me, used to put me up against people who outweighed me by 50 to 75 pounds and I usually got pinned in under 30 seconds. I would never pay to watch Greco-Roman wrestling but I would watch it on TV since I’d be watching people who were at the top of their sport. My objection to removing it is simply that it is a traditional Olympic Sport, just as the javelin throw, for instance. The excitement I feel watching sport comes from seeing people with great skills compete. Now it’s I also watch golf on TV, but I wouldn’t as an Olympic sport, because it isn’t. For me, in the 1970s, being an Olympic long-distance runner was one of my main goals. I think I was the official Emil Zatopek fan in North Dallas. I’d even occasionally run in hiking boots so I could be more like him. I’m also waiting for the IOC to re-instate the standing broad jump–another sport in which I excelled (in my mind). Who would win the medal, the golfer or the caddy who always seems (to me a non golf player) to be the one calling the shots.